Chief doctor of the NeoVízia Eye Clinic, Bratislava Radovan Piovarči, M.D. Dr. Radovan Piovarči mostly performs surgeries of the anterior and posterior eye segment, surgeries of cataract, PRELEX and RLE surgeries and implantations of phakic eye lenses ICL, as well as vitreoctomies. In the field of refractive errors he diagnoses refractive errors and performs laser surgeries with the methods ReLEx SMILE and femtoLASIK, using the femtosecond laser. He also diagnoses and treats keratoconus and performs implantations of corneal rings ICRS and CXL surgeries. In diagnostics, his specialties entail diseases of the retina, macula, diagnostics using the OCT machine (OCT TZN and macula), and he performs SLT (selective laser trabeculoplasty), LI (laser iridotomy), YAG (YAG capsulotomy), ALK (argon laser coagulation), FAG (fluorescein angiography) and ultrasonography (USG). 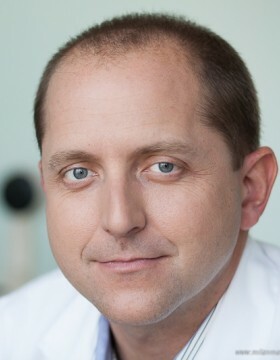 Dr. Piovarči is a member of the Czech Vitreoretinal Society and is active as a lecturer in the Department of Ophthalmology at the Slovak Medical University. He has completed a number of courses and internships at home and abroad. He is a member of the Czech Ophthalmic Society, the Czech Society of Refractive and Cataract Surgery and the European Society of Cataract and Refractive Surgery (ESCRS). 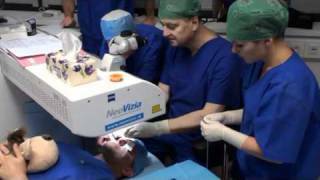 Dr. Piovarči has undergone an eye surgery with the surgical procedure femtoLASIK, performed with a femtosecond laser in 2010 at our Eye Clinic NeoVízia. The surgical procedure was performed by Dr. Josef Hycl. „The fact that I have undergone an eye surgery with the surgical procedure femtoLASIK, is a great help to me. My patients are asking me about details that I could never answer just as a surgeon. Thanks to femtoLASIK,, I can also provide them with my point of view as a patient, describe everything they will feel during the procedure and calm them down if they are experiencing some fear,“ explains Dr. Piovarči. Help us improve our care. Send your suggestions directly to the Director. Copyright © 2008-2019, NeoVize s.r.o. All Rights Reserved.